Is It Time to Buy Altria Group, Inc. Stock? As its two main rivals team up, can Altria answer the challenge and stave off adverse trends in tobacco? For decades, Altria Group (NYSE:MO) has been a leader in the tobacco industry, giving investors huge total returns both from its always-impressive dividend yield and long-term share-price appreciation. Even as the regulatory picture in the U.S. has become more unfavorable for tobacco over the years, Altria has pressed higher; when you adjust for its spinoff of Philip Morris International (NYSE:PM) in early 2008, Altria has regularly hit new all-time highs. Yet with the impending merger of tobacco rivals Reynolds American (NYSE:RAI) and Lorillard (UNKNOWN:LO.DL), Altria faces an all-new competitive threat that could challenge its leadership position in tobacco. Let's take a closer look at Altria Group to see whether now is a good time to buy the this stock. 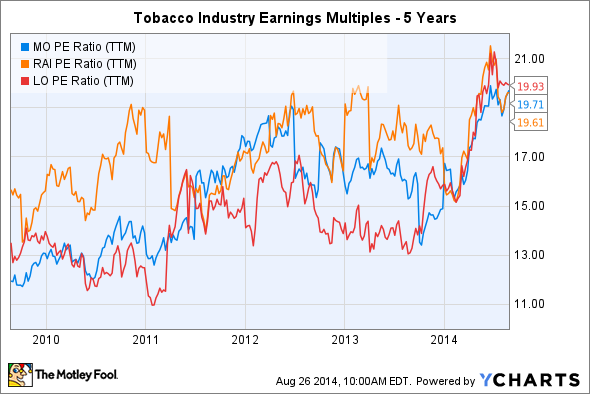 Throughout much of its history, the tobacco industry sported exceptionally low valuations. The ever-present threat of litigation that could simultaneously devastate the entire industry's business model and produce crushing multibillion-dollar awards hung over Altria and its peers, and many investors simply weren't willing to risk losing everything if a jury verdict went against the industry. That risk aversion left greater potential returns for those willing to gamble on the fate of tobacco, and Altria and the rest of the industry got through the most dangerous phases of litigation without seeing the catastrophic hit so many had feared. Over time, though, investors have become more comfortable with the prospects for the tobacco industry, and that has sent valuations higher. Moreover, with the Federal Reserve's low interest rate policy, stocks that pay dividends have generally attracted more attention from investors, and Altria, Lorillard, and Reynolds American all have dividend yields well in excess of the market average. That combination, along with the recent merger announcement between Reynolds American and Lorillard, sent earnings multiples on Altria and its rivals to nearly unprecedented levels. Altria P/E Ratio (TTM) data by YCharts. Given the steady drop in cigarette sales volume and the ever-present regulatory threats to the industry, Altria's growth prospects alone can't justify those earnings multiples. What investors are counting on, though, is the steady increase in dividends that they've enjoyed over time. Altria has a strong history of regularly raising its payouts, and combined with spinoffs of Philip Morris and Kraft along the way, shareholders have done quite well with this dividend policy. 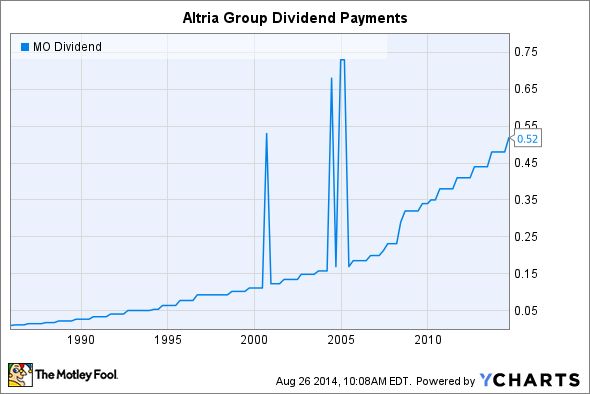 Altria Dividend data by YCharts. Spikes reflect adjustments for spun-off businesses and should be ignored for quarterly payment comparison purposes. How big a threat to Altria is the Reynolds American-Lorillard deal? The bigger concern for Altria is the potential for future growth. Reynolds' major brands have appeal to younger smokers and have had better growth rates than the overall market. As a result, even if the new Reynolds doesn't immediately top Altria's market share, it could do so in the not too distant future if those growth rates hold.Altria has long held the undisputed position atop the U.S. tobacco industry. But if the Reynolds-Lorillard merger goes through, Altria will have a fight on its hands. In the cigarette realm, Reynolds will add the valuable Newport brand to its existing lineup, which includes the popular Camel cigarettes. Altria did dodge a bullet with Reynolds' decision to divest the blu eCigs brand of electronic cigarettes, which Lorillard helped develop into the market leader in the fast-growing segment. But Reynolds will also retain its strength in smokeless tobacco. All told, the merged company could enjoy 30% to 40% market share in cigarettes and smokeless products. Is Altria Group a good buy right now? The key to Altria's value as a stock right now is its 4.7% dividend yield and the prospects for even larger payouts down the road. Yet as regulatory efforts begin to target e-cigarettes, and as further restrictions on tobacco use become more prevalent, the fundamentals of the domestic tobacco market are questionable at best. In the past, investors got a discount for accepting those industry-threatening risks, but at current valuations, Altria shareholders have to pay premium prices just to get the income stream they value so highly. Despite its impressive long-term track record, now is far from the ideal time to buy Altria stock.